When Tess's grandfather's memory becomes progressively worse, her older sister, Ivy, steps in and whisks her away to Washington, while her grandfather is given excellent medical care in Boston. Tess is enrolled in Hardwicke, a private school where all of her classmates seem to have some connection to the upper echelon of Washington, D.C.'s ruling class. When Tess takes care of a bully for the vice president's daughter, she establishes the same reputation her sister has-- she fixes problems. Ivy's work is very secretive, but soon becomes enmeshed with the complications at Hardwicke. Henry's grandfather has died... Supreme Court Justice Marquette. Vivvie thinks her father might have had something to do with it... her father, Major Bharani, is the White House physician. Add into the mix "kingmaker" William Keyes, who seems to be behind the nomination for Judge Pierce to replace Marquette, and things get very complicated very fast. Tess, Vivvie and Henry, along with several other friends, try to figure out what's going on without telling Ivy too much. They make some progress, but the body count keeps climbing, and eventually Tess's life is imperiled as well. Between the government secrets and family ones, Ivy and Tess have a lot of ground to cover before they can connect as a family. For fans of Ally Carter's Gallagher Girls series or Anabel Mongahan's A Girl Called Digit, this is a politically charged, convoluted mystery with a great private school connection. Even though Tess is new to the Washington scene, and her roots on a Montana ranch are never downplayed, she quickly becomes knowledgeable about the in and outs of political intrigue. While her initial investigations are spurred because of her concern for classmates, she quickly realizes that much more is at stake. This is all done in a convincing manner, which is important because... well, couldn't any of us arrive in Washington and soon work our way into the inner circle, uncovering all of its secrets? The Fixer allows the reader to plunge right into the story and be a part of the political machinations! Even though there are a number of characters, Barnes does a good job at giving them all distinct personalities. While there isn't a romance in this book, there is a chance in the second book (coming out in 2016) to choose between the proper, respectful Henry and the goofy, irresponsible Asher. Ivy has just enough mystery about what she does to make her interesting, and I'm now really curious to see what her "driver", Bodie, has in his background. There are a number of characters killed off, but the murders occur off screen, making this a young adult book that is also suitable for middle grade readers, unlike The Naturals series, which was graphically violent. 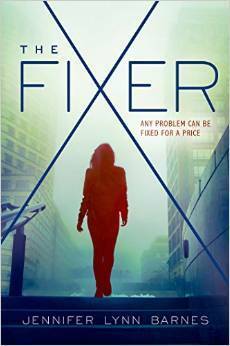 Barnes is a facile writer, and The Fixer is a riveting page turner. There are several twists I should have seen coming and didn't, and I can't wait to get back to D.C. and find out what Tess's next adventure will be!